This is a beautiful and well made bed. It looks great in the bedroom and adds a bit of masculinity to the space. It’s comfortable to lean on while reading in bed. It’s sturdy and easy to put together. We are very pleased with this purchase and highly recommended it. Complement your modern decor with this sleek platform bed from Porch & Den. The eye-catching headboard is padded for comfort and detailed stitching creates square-shaped accents. Black faux-leather wraps around the entire frame for a soft, yet contemporary feel. Received bed in 2 different packages on 2 consecutive days(3 days after ordering online). 1 package contained headboard and the other was bed frame. Package contained all the items required for the bed assembly. But manual was little difficult to understand as headboard has 1 manual and bed frame has another manual, both containing step1 and step2. We followed headboard manual first and then bed frame manual. After that followed the combined manual. There is 1 set of nails in headboard box and the other one in bedframe box. If you mix up those, it may lead to confusion(By looking at the manual, arrange all nails of different sizes separately). It was little to difficult to assemble the bed. But the final result was overwhelming. We liked the bed and the quality of it. I would recommend it to my friends. Really happy with the purchase. Bed frame is exactly as described and is very sturdy. It came in 2 boxes with all the parts necessary and was very easy to put together, not difficult whatsoever. Instructions were easy to follow, had good illustration and not confusing whatsoever. My 12 inch foam mattress fits perfectly on it. I would gladly recommend this to anyone. Style with a budget in mind! Very simple, but classy base platform bed. Sturdy as well. I am happy with it for the price! was a little apprehensive about buying a bed online but this was an amazing deal and the bed is high quality and will not hesitate to purchase furniture from overstock again. Thank you!! Great simple modern style platform bed . I’m loving this bed . It took my hubby about an hour to put it together , but not complicated. It looks very modern and stylish . I use a memory foam mattress in it . Only wish it had some storage drawers . This is a very nice bed but can be very confusing while following the two manuals. It took me about two hours to complete. I can’t wait to place my hybrid mattress on the finish product to determine how stern the wood panels will hold up. Pretty easy to put together. Comfortable and seems like good quality so far, after two nights! I found the assembling instructions a bit confusing. The orientation of some key components was not clearly states and as a result I had to reassemble some parts. 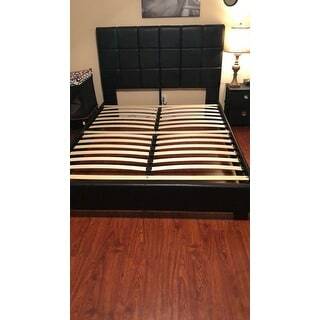 However, the bed itself is sturdy and looks great for the price. very nice bed. easy to put together. "what height of memory foam mattress should I need to buy?" You can use any 8”, 10”, or 12” memory foam mattress with this platform bed without the use of a box spring. "Hi, I have 80*60*8 mattress(8 inch mattress). Does this mattress fit in the bed? Would the gap below first row of headboard be visible?" Yes, your mattress would fit in the bed. The dimensions for this bed are 86 inches L x 63 inches W and our slats are spaced 3 inches apart. "Hello. For the materials, it states it's made of "wood". Is this solid or particle/mdf? Thank you!" "Does this include the headboard?" Yes, the headboard is attached and included. "does it need a springbox?" No it does not require a box spring. "Good Morning, Approximately, what is the size of the mattress in the picture shown? I have a 12" mattress and want to know if it would come close to the picture. Thank You. Carlos"
You have approximately 36 inches from the top of the slats to the top of the headboard. Your 12 inch mattress would probably be very close to the bottom of the second row of squares.